Every year I meet a lot of people who dream of starting a dog training business. There are many reasons someone would choose to hang up a shingle and become a professional dog trainer. Perhaps a career change is appealing because their current career is leading to burnout, or is becoming a dead-end. Maybe the thought of being your own boss and the freedom that brings is inviting. Or, perhaps a love for dogs and clicker training is so strong that it leads someone to devote his or her life to improving the relationships people have with their pets. Unfortunately, despite the sense of optimism and adventure that can accompany someone on the path to starting a dog training business, it can be a very difficult road to travel. According to the US Small Business Administration, 30% of new businesses fail within the first two years; that number jumps to a 50% failure rate within the first five years. Those percentages are true across all industries. I’m fairly confident that the failure rate for dog training businesses is much higher. My business, When Hounds Fly, is quickly approaching its six-year anniversary and continues to grow year after year. In hindsight, it is easy to say that it was a great decision to start the business when I did and the way I did. But at the time I was just another dreamer with, statistically, that 50/50 shot. However, I’m not really a gambler. I was totally confident that I had a good shot at success because I had thought hard about and prepared well for the challenge of opening my dog training business. 1. Is there enough demand for dog training? You would never open an umbrella store near Death Valley or the Atacama Desert, would you? However, it’s not uncommon to see dog training businesses operate in sparsely populated and remote parts of the country where there just aren’t that many dog owners. According to the most recent survey from the Humane Society of the US (HSUS, 2012), nearly half of the households in the US (47%) have at least one dog. If the town where you would like to open your business has only 10,000 people, and you average/assume 4 people per household, that’s 2500 households, or 1250 total dogs that could possibly use your services. from a park in downtown Toronto! If the average dog lives 10 years, and you manage to attract 25% of your market (a very optimistic number! ), that translates to only 300 dogs over 10 years, or 30 dogs a year. Assuming a modest revenue-per-dog estimate of $250, your gross revenue would be $7500. That’s not a viable business; it’s maybe a hobby. Even if you decided to include neighbouring towns and were able to increase all the numbers by 5, it’s still barely more than a hobby business. The reality is that you need to go where the demand is high. Population density and dog-ownership percentages have to be high enough to support a business. A related consideration is that the demand for dog training services increases with population density. 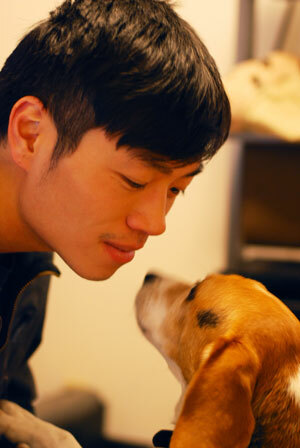 Urban dwellers must have well-socialized and well-trained companion pets to survive. Suburban and rural dogs have a lot fewer expectations placed on them. My business, When Hounds Fly, is quickly approaching its six-year anniversary and continues to grow year after year. My advice here is to open your business where the dogs are. The denser the dog population, the better! The only exception to this counsel would be for someone who is already a highly established and successful trainer. People will come from all over the county, state, country, or even cross international borders to see a well-known professional pet trainer. If that is you, you can set up shop anywhere and be busy. When you have identified the key areas where dogs and their owners are, you have an estimate of the demand side. Now it’s time to look at the other key side—the supply. 2. Can you beat your competition? Perhaps you are lucky and you have identified a market where there are many dog owners and dogs that need training—and not a single dog trainer has opened up shop in that area! If that’s the case, what are you waiting for? Get moving! 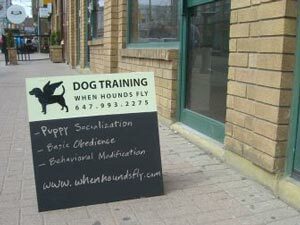 The reality is that if there are dogs around, there are dog trainers around. These trainers are going to be more established than you, since you’re just starting out. What is important to determine is how busy those trainers are, and whether you have a unique offering that you can use to differentiate yourself. Consider surveying other dog training schools in the market to determine how long in advance their group classes fill. If you are focusing on private lessons, what’s the earliest appointment you can get? These inquiries can result in some useful “intel.” After all, if everyone’s busy for weeks or even months ahead, it must mean there is a shortage of dog training services in the market. On the other hand, if multiple schools’ group classes are struggling to be filled, and every dog trainer in town can see you today, it probably means there is an excess supply of trainers in the area. Although other dog trainers in your area may be struggling, that is not necessarily a sign to give up. First, consider your ability to differentiate yourself from other offerings as a way to compete. For example, perhaps most (or all?) of the other dog training businesses near you use aversive and punishment-based training. That’s encouraging, as there may be a latent demand for clicker training classes in this market, a market that is waiting to be tapped into. My advice is to focus on high-quality service at a premium cost. As more trainers move toward positive reinforcement training, you’ll have to start differentiating even further. My advice is to focus on high-quality service at a premium cost—it’s hard to differentiate just by competing on price (and it is not fun). Marketing yourself as a Karen Pryor Academy (KPA) Certified Training Partner (CTP), for example, can really give you a jump start when you first begin. Now that you have looked outward and determined there is sufficient demand for more dog training services in your market, look inward. Do you have what it takes? 3. Have you ever fixed a website? How about a toilet? At every ClickerExpo I have attended, really any time I chat with other dog training business owners, we all share one thing in common. We have all vacuumed and mopped so often that we have it down to a science! Fortunately, at some point in the growth of a business the owner no longer needs to be mopping the floors, taking out the trash, or cleaning the toilets. But, for a very long time, be prepared to get your hands dirty. This kind of work goes beyond simple cleaning duty. Assuming you are starting the business on a tight and strict budget, you’re not going to have lots of money to hire a web designer, marketing firm, accountant, lawyer, general contractor, or cleaning service. My advice is to bootstrap your dog training business as much as possible, which means you need to learn all of these skills—or find people who can help you pro bono—to keep your start-up costs low. Learn website design (or at least website maintenance), the basics of online marketing, basic bookkeeping and accounting, household repairs, plumbing, and painting. These simple skills can be the difference between getting off the ground or not. The downside to bootstrapping your business is that you will get off the ground slower, and it may take time to acquire these skills before starting. Well-financed businesses start by raising a lot of capital so that these specialized resources are available immediately. The huge upside to bootstrapping, though, is that you reduce your start-up costs considerably. And, if the business fails, you will greatly reduce the impact on your own financial health. 4. How strong are your dog training skills and knowledge? Believe it or not, frequently I receive e-mail from people asking if I take on apprentices because they want to learn how to become a dog trainer. When I ask about their experience, a few have told me they have never even owned a dog! Most have owned a dog but have never been to a dog training class themselves! Because dog training is unregulated, anyone can be a dog trainer. This opens the door to unqualified people actively advertising their services and wasting people’s money. Someone with little experience or background who wants to open a dog training business is a good example of the Dunning-Kruger effect. The Duning-Kruger effect is a cognitive bias where individuals grossly overestimate their own skills and ability. Let common sense prevail. How can you teach classes effectively if you have never even been a student in a class? Or, how can you help someone with an aggressive dog if you have never helped an aggressive dog yourself? My advice is to get unbiased, objective, and third-party opinions of your dog training knowledge and handling skills. If you have been taking group classes or private lessons with your own dog, perhaps your instructor has already suggested that you’re an excellent dog trainer! I’d consider the opinion (and encouragement) of a Karen Pryor Academy CTP to be the gold standard in measuring your readiness. But that’s still not enough! Sufficient dog training skill is just half of what you’ll need to delight your clients, earn repeat business and referrals, and grow. Next, turn your focus to the other end of the leash. 5. You like dogs, right? But how are you with people? My love for my dog, Duke, got me hooked into dog training as a hobby, but, make no mistake, my love of coaching, mentoring, and helping motivated people succeed is what got me into the dog training business. To survive in the dog training business, delight in helping others has to be of intrinsic value to you. Do you have a history of helping others learn new skills, grow, and succeed? Perhaps you coached athletes? Taught students? Mentored others? Can you recall how you felt when you saw your students’ eyes light up when they finally overcame a challenge and achieved their goals, thanks to your help? To survive in the dog training business, delight in helping others has to be of intrinsic value to you. That is what will keep you motivated over the long term. For my entire life I have gravitated toward mentoring and teaching others. I love doing it. Unfortunately, too many would-be dog trainers only have the dog on their minds. Like the majority of us in the dog training world, you’ll be working with the owners of dogs, teaching owners how to train their dogs. What skills do you need to be successful here? What do trainers need to teach people? My advice is to practice teaching and coaching others, and ask them for honest feedback about your effectiveness. If you make it easy for people to understand how to train their dog, or correct their golf stroke, you probably have what it takes to succeed in dog training. If you need work, consider investing in certification programs like those offered by TAGteach International. Or, increase your dog training knowledge and coaching skills simultaneously by enrolling in the Karen Pryor Academy Dog Trainer Foundations course! All signs point to YES! So, now what? Don’t re-invent the wheel! If you are starting a business and don’t know where to begin, there are many free resources to guide you along the way. Your municipal government probably has new business start-up resources available for you (both online and in person). Since each municipality may have different rules regarding licensing and registration, it’s wise to look local first. My advice would be to exhaust all the free resources that are out there for you; you may even find that free business-planning services or financial grants are there for the taking! Starting a dog training business is not for the faint of heart or risk-averse. A number of my entrepreneurial friends have benefitted from mentorship programs, incubator programs, and other government-run services that helped them get off the ground. Once you have a sense of what needs to be done, I would definitely create a full business plan as a blueprint for the road ahead. Even with a well-prepared plan, starting a business isn’t easy. There’s a lot of blood, sweat, and tears ahead, and it can take quite a while for the clientele and revenue of a new business to ramp up. Starting a dog training business is not for the faint of heart or risk-averse. But, take heart—if you have been able to respond positively to my five questions, congratulations! You are probably in a position where starting a dog training business is a sound idea. Andre Yeu, KPA CTP, offers modular training classes on a flexible schedule through his business When Hounds Fly in Toronto. With two locations and a team of certified trainers, When Hounds Fly is Andre’s dream-come-true. Interviewed frequently by print and digital media and enjoying success today, Andre remembers well the early days of creating his business! Why Isn't Clicker Training on Oprah?